There were warnings and protests from Iranian hardliners last weekend, when European Union foreign policy chief Catherine Ashton met with  with several human rights activists at the Austrian embassy in Tehran on Saturday, March 8, 2014. 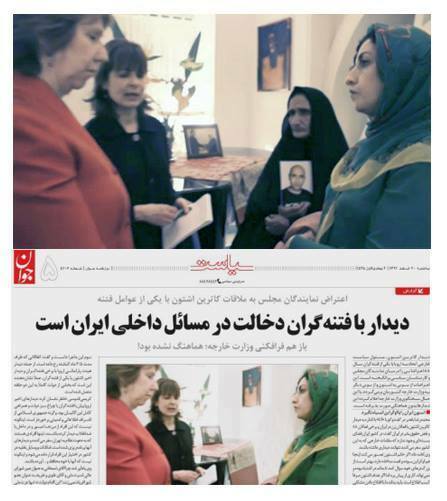 In a negative article about the meeting, conservative newspaper Javan, doctored  a photo, erasing an image of Gohar Eshghi, the mother of the blogger Sattar Beheshti , who died under torture in police custody in 2012. Javan later published  both photos with an explanation, saying they had censored the photo to avoid criticism for labeling the bloggers’ aging mother a “seditionist”. Mohammad Hassan Najmi tweeted  a photo of a propaganda billboard showing Ashton's face halved and shared with Saddam Hussein's. In Tehran, some posters on billboards depict Ashton's face as half Saddam Hussein  [former Iraqi president who led a war against Iran, 1980-88].